President Donald Trump speaks during the White House Opportunity and Revitalization Council meeting in the Cabinet Room of the White House, Thursday, April 4, 2019, in Washington. 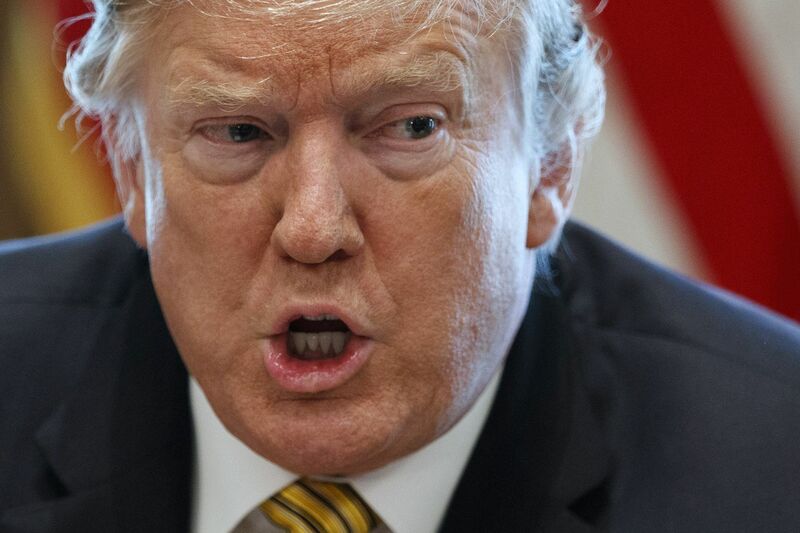 WASHINGTON - The White House could attempt to block the release of President Donald Trump's tax returns to Democrats, senior officials signaled on Thursday, an unprecedented step that could lead to a constitutional challenge and catapult the issue into federal court. White House press secretary Sarah Sanders said Trump would not release his tax returns because they were under audit, a disputed claim that the White House has not allowed to be independently verified. "While his taxes continue to be under audit, he doesn't anticipate that changing at any point anytime soon, and therefore doesn't have any intention to release those returns," Sanders said on Fox News. House Ways and Means Committee Chairman Richard Neal, D-Mass., on Wednesday formally requested that the Internal Revenue Service turn over six years of Trump's personal and business tax returns, invoking a 1924 law that gives the IRS little wiggle room to ignore. "The six-year decision was reached because the IRS advises you should retain six years of your tax records," Neal said Thursday. "And we thought if this were to end up in court we didn't want an issue, for example if you were requesting eight years, where it would be thrown out based on a technicality." Neal also disputed the assertion that an audit would prevent Trump from releasing his returns. Independent experts have also said Trump could release his returns if he wanted to, even if he were being audited - something that all previous presidents dating back to Richard Nixon have done voluntarily. "The professional staff and the attorneys say that you can still submit your tax forms even if you're under audit," Neal said. The 1924 law that gives Neal the authority to compel the records amended the internal revenue code, which says the treasury secretary "shall furnish . . . any return or return information specified" in a request from the head of the House or Senate tax-writing committees. The law does not appear to give the treasury secretary any legal mechanism to deny the request. Neal said in his letter to the IRS that his committee was considering legislative proposals about - and conducting oversight of - "the extent to which the IRS audits and enforces the Federal tax laws against a president." A president's individual tax returns are subject to mandatory IRS examination, but that is IRS practice, not federal law, according to Neal. He said access to the president's tax records - along with records of IRS treatment of them - was necessary to determine the scope of any IRS examination of Trump's returns. Treasury Secretary Steven Mnuchin, who served as Trump's finance chairman during the 2016 campaign, has not commented publicly since Neal sent the request to the IRS on Wednesday. In the past, Mnuchin has said he would consult with his legal advisers and follow the law. The IRS also has not said anything about Neal's request. The 1924 law does not appear to give the White House input about whether the IRS furnishes an individual's tax returns. In fact, the law was written in part to give Congress the ability to scrutinize the tax returns of executive branch officials to investigate conflicts of interest or other potential improprieties because of the Teapot Dome scandal in the early 1920s. Trump and Sanders in recent days have asserted that because the tax returns are under audit, they will not be released. But Trump's former attorney Michael Cohen told a congressional committee earlier this year that Trump's taxes were never under audit and that he simply didn't want any scrutiny over his financial dealings. "What he didn't want is to have an entire group of think tanks that are tax experts run through his tax return and start ripping it to pieces, and then he'll end up in an audit, and he'll ultimately have taxable consequences, penalties and so on," Cohen said, adding, "I presume that he is not under audit." Neal's request for Trump's returns came amid a flurry of House Democratic moves to obtain Trump administration records, including a vote by the House Judiciary Committee on Wednesday to authorize subpoenas to obtain special counsel Robert Mueller's full report on Russian interference in the 2016 presidential election. But Neal insisted he was moving deliberately and without political motivation or regard to other committee's timetables. He said that if the IRS does not furnish the requested records by April 10 - the deadline he set in Wednesday's request - his response will be a follow-up letter to the IRS. "This is about the institution of the presidency," Neal said. "We'll proceed from there. It's up to the IRS commissioner to make the determination. The law says 'shall.' "
Democrats believe that Trump's tax returns could shed light on a number of issues, including whether the president improperly inflated his assets, had questionable dealings with foreign countries or benefited personally from the 2017 tax law. If Mnuchin provides the tax returns, they would not be made immediately available to the public. Rather, Neal would likely have to set up strict rules for who could see them and scrutinize them, and the information would have to be closely held because it would still be protected taxpayer information. It's ultimately possible the returns could become public, but that would require a vote of the full committee, and Neal's aides cautioned that they were nowhere near that point. Congressional Republicans have unified in opposition to Neal's request, including Senate Finance Committee Chairman Charles Grassley, R-Iowa, who also has the legal right to request Trump's tax returns. Grassley had previously said that if the Ways and Means Committee got Trump's tax records, he wanted the Finance Committee to have them, too, but he has backtracked and indicated that he will not seek Trump's tax returns. Grassley delivered a fiery speech on the Senate floor Thursday, criticizing House Democrats for seeking Trump's taxes. "They dislike him with a passion, and they want his tax returns to destroy him," Grassley said. "That's all that this whole process is about, and it's Nixonian to the core." House Speaker Nancy Pelosi, D-Calif., dismissed such criticism at a news conference Thursday in which she defended Neal's move. "The president and the vice president are audited. That's what happens - they're audited. Congress has an oversight responsibility to see that that is happening, if it has happened and how it has happened, and that's the policy aspect of this," Pelosi said, adding of Neal: "I commend him for his thoughtfulness on the subject and how he has proceeded with it." Some liberals in the House had wanted Neal to move faster on the tax returns request, but on Thursday they, too, offered praise for his actions. "Richie's very methodical; that's how he operates," said Rep. Bill Pascrell, D-N.J. "Yesterday was as innocuous a time as you could select, rather than wait till April 15 or any other time." Two former IRS commissioners - Mark Everson, who served under President George W. Bush, and John Koskinen, who served under President Barack Obama - said it was possible for Trump to have been more or less continually under audit, given the complexity and size of his business. "It wouldn't be the usual course, but it wouldn't be unusual in the extreme, either," Koskinen said. Neal's letter says the request for Trump's returns is part of a broader effort to understand how the IRS applies federal tax law to the U.S. president, which raises the question of why Congress would need to see Trump's taxes in the years before he is elected, Everson said. But, he added, the law seems clear that the Treasury is obligated to turn over the returns.